"Myth 1: You’ll have to stop having dinner parties. So many of my clients presume they’ll have to resign themselves to only inviting one couple over at a time to huddle around a version of the tiny chrome and glass dining they saw in the model suite. It’s just not true. We may need to be creative — opting for an extendable table that can shrink and grow as the guest list does or streamlining with a bench on one side — but I promise there is always a way. Myth 2: You can only buy small furniture. Oh, if I had a quarter for every condo I’ve seen with 15 teeny tiny pieces of furniture in one small living room. Too many separate pieces look cluttered and only works to make the space seem smaller and busier than a few standard sized pieces would. 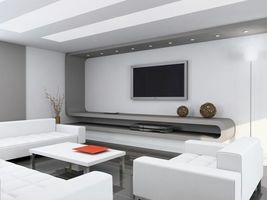 In fact, a streamlined sectional is often the best solution as it can hug the walls, but still allow for ample seating. Keep the pieces simple and tailored, but don’t be afraid to buy grownup sized! Myth 3: Your condo is too new and generic to have character. The beauty of older homes is the built-in character. A few hundred Victorian renos later I can tell you with character comes expensive hidden problems; knob and tube, shifting foundations. If you have the patience and budget, they will pay you back with claw foot tubs and existing mouldings. Here’s the thing, all of those things can be added to your condo. Think of it as a blank slate (with straight walls and electrical to code!) Go ahead and add a lovely applied moulding in the living room. You can renovate the washroom as long as you keep the plumbing locations in their existing locations. Why not install a reclaimed claw foot tub if that’s what you love. Like an artist with a blank white canvas you truly can create whatever your imagination can dream up."